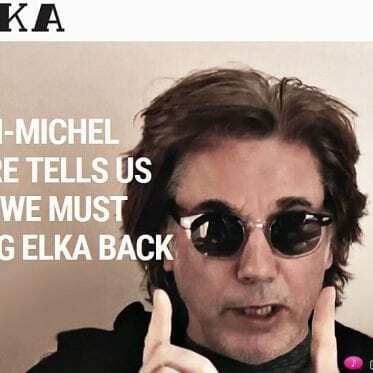 Given the absence of that rich-sounding, analogue ‘synthesizer-voice-on-a-chip’ (CEM3394) from Curtis Electromusic Specialities successor OnChip, how does the Dark Energy II sound? 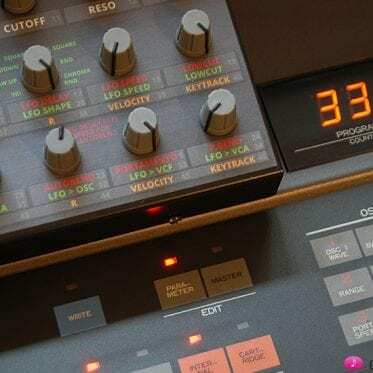 Still rich, still analogue — with 20 to 30 minutes tuning time needed for the VCO’s temperature-controlled pure analogue circuitry, but different… mainly because of the completely different filter type. Notable differences in specification between the two — together with a number of functional additions to the Dark Energy II — are as follows: firstly, the Dark Energy II features a sawtooth-based VCO core (compared to the Dark Energy’s triangle-based one), which, as implied, outputs a sawtooth waveform, with a waveform Shape switch for selecting sawtooth, off, or clipped/inverted sawtooth; meanwhile, that all-important, sounding-defining VCF is centred around a 12dB multimode filter with lowpass, notch, highpass, and bandpass, together with an all-new filter Mode control for continuous transition from lowpass via notch and highpass around to bandpass (as opposed the 24dB lowpass variety with linear frequency modulation (LFM) control found on the Dark Energy); the VCF’s exponential frequency modulation (XFM) control also has a polarization function, whereby the modulation source (LFO2 or ADSR) selected by the Source switch can affect the filter frequency with a positive or negative behaviour (by rotating rightwards or leftwards, respectively); finally, the VCA has an exponential scale (unlike the Dark Energy’s combined linear/exponential scale). 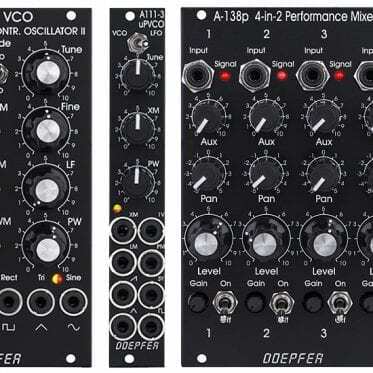 Benefitting those with a modicum of electronics know-how, the Dark Energy II offers much more internal expansion possibilities than its ‘Mk I’ predecessor courtesy of pin header terminals for the following functions: rectangle and sawtooth VCO outputs, linear FM input for VCO, hard sync input for VCO, lowpass/bandpass/highpass VCF output, rectangle and triangle outputs for each LFO, and optional reset/direction features for each LFO — all conspiring to make this already flexible synthesizer even more flexible! 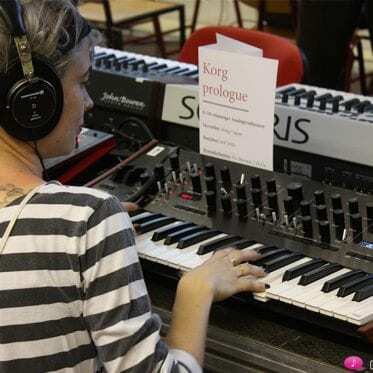 The upshot of those differences is that sounds created on a Dark Energy II of course cannot be replicated on a Dark Energy (and vise versa) — though there is nothing to stop the two distinctive synthesizers from being daisy-chained together to produce an even wider palette of sounds. 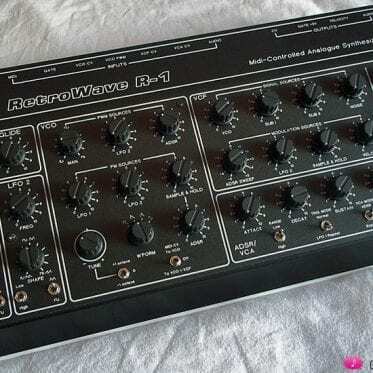 Indeed, several units can be polyphonically or monophonically cascaded (via internal MIDI out/MIDI in connections) to create an ‘über-synth’ of sorts! 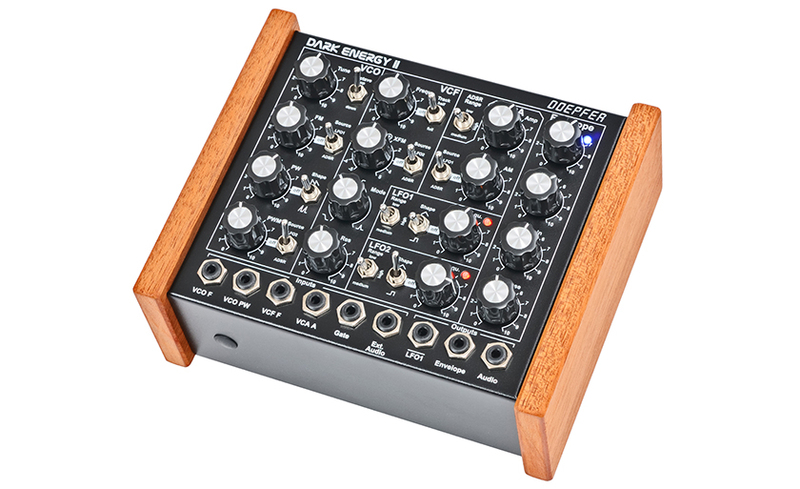 Like the Dark Energy, the Dark Energy II is a standalone monophonic analogue synthesizer with inbuilt USB/MIDI interfacing and CV connectivity housed in a rugged black metal case with wooden end cheeks; likewise, sound generation and all modulation sources are 100 percent analogue, appealing to purists — only the USB/MIDI interface includes digital components, naturally! Again, vintage-looking, high-quality potentiometers with metal shafts are used throughout, and all are fixed to the casing — except for that all-new filter Mode control — to ensure stability. 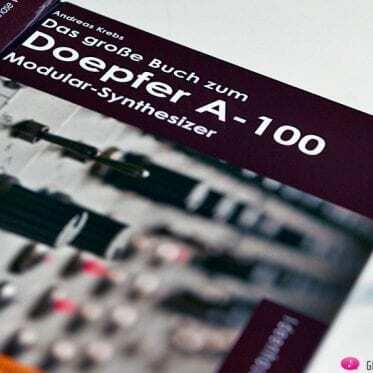 Spacing between them is generous (in comparison to the necessarily smaller A-100 Analog Modular System modules like the A-111-5 Mini Synthesizer Voice equivalent of the original Dark Energy) to ease sound-shaping manipulation. 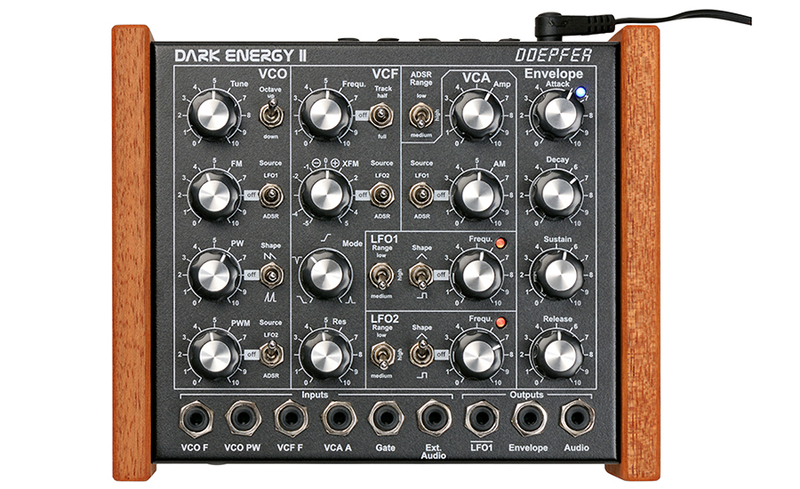 In truth, then, the Dark Energy II is — to all intents and purposes — an all-new synthesizer from Doepfer! Why not plug in and play? 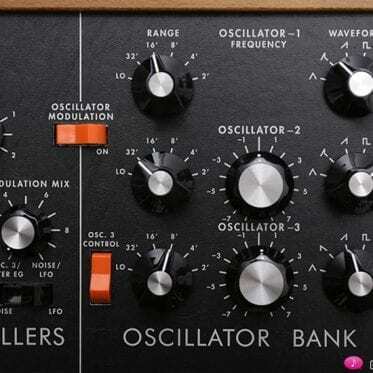 the basic waveform of the VCO is saw (not triangle like the Dark Energy I). because of the pure analog circuit and the temperature control it may take up to 20-30 minutes until the VCO is in tune. The sound of the Dark Energy II differs clearly from the Dark Energy I (mainly because of the completely different filter type). If you already own a Dark Energy I the Dark Energy II can be used as an expansion. But you will not be able to copy sounds of the Dark Energy I with the Dark Energy II (and vice versa) ! 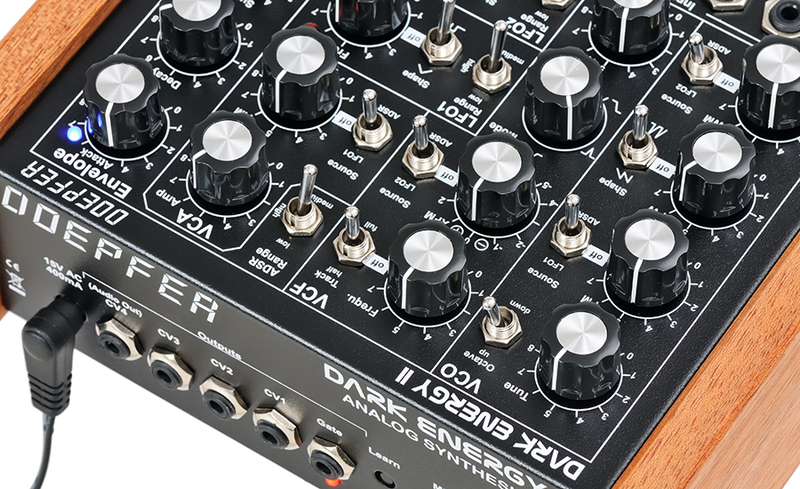 For users with electronic knowledge the Dark Energy II offers much more internal expansion features than the Dark Energy I. 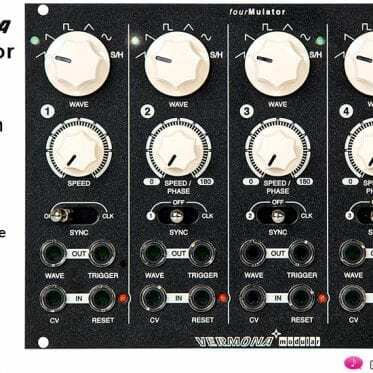 For example terminals (pin headers) for these features are available: VCO Hard Sync, linear VCO FM, rectangle and sawtoooth output of the VCO, lowpass/bandpass/highpass output of the VC, Reset/Sync/Direction for each LFO, rectangle and triangle output for each LFO. 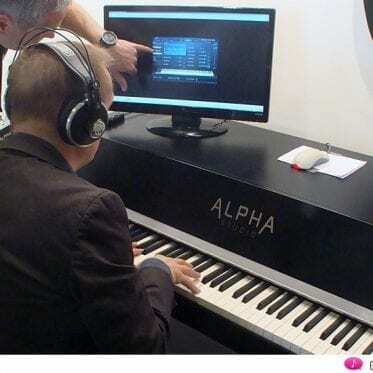 In addition an improved version of the glide option is is the planning stage that allows to turn on/off the glide function via Midi control change messages.